In the summer, during the World Cup, I happened to point out that I was very pleased Ryan Gauld had signed for Sporting Lisbon. He hadn’t chosen the easy option in going to the Old Firm or England – he’d made the right choice and tried to broaden his horizons. Gauld’s choice has begun to show its worth. Though he has been playing much of his football for the Sporting B team, he scored two in 12 minutes tonight for the A team, away to Belenenses in the cup. Though Sporting lost, this is hopefully the first point in a very successful career for “Mini Messi” in Europe. Hopefully more promising Scottish youngsters will follow his lead and look beyond Glasgow or the West Midlands. Given that the acronym of “Benny Andrew Hall of Fame” that I’ve decided to establish is BAHOF, and that’s almost Bahnhof which is a German railway station, I thought it only right to give Benny Andrew some German company first of all in his Hall of Fame. The gentleman who gets the honour is Lars Ricken, most famous for one goal (which is mentioned in this month’s Four Four Two, hence my inspiration) in a Champions League final. However, he’s not only about that goal. Ricken is a one-club man, having started with Borussia Dortmund in 1993 and eventually retiring in 2009. Though his career was much affected by injury, his 301 league matches for Dortmund brought with them 49 goals from midfield. His most decisive contribution was of course in that 1997 Champions League final. Juventus were ironed-on favourites for the final that year, having won the previous year’s competition on penalties against Ajax. I remember my nearly 13-year-old self being enraptured by Juve’s unbelievable line-up and was totally convinced they would walk it against the schwarz and gelb. The Italians started with, among others, Peruzzi in goal, Deschamps and Zidane in midfield and Boksic and Vieri up front. The Juve XI was so good that Marcello Lippi started Alessandro Del Piero on the bench! That’s not to say that Dortmund were slouches, however. Matthias Sammer, Andreas Moller and Karl-Heinz Riedle brought a strong German spine to the side, while Paul Lambert was a surprisingly integral part of the side from the Ruhr for that seminal season in the club’s history. As it was, of course, the Old Lady’s tag of favourite was destroyed within the first 35 minutes with two quick-fire goals from Riedle. Lippi threw Del Piero on at half time and the move had the desired effect, the future Juve legend pulling a goal back in the 65th minute. For all of six minutes, Juventus were back in the game. Enter the 20-year old Ricken. On the field for 16 seconds, he collected a beautiful through-ball from Andy Moller and with a first time chip, lofted the ball at speed over Angelo Peruzzi’s head. According to Ricken’s chat with FourFourTwo regarding his goal, he had seemingly been watching Peruzzi for the entire match, noticing he was standing a little bit off his line. It was a stunning goal and came at a perfect time – from then Juve were floored. 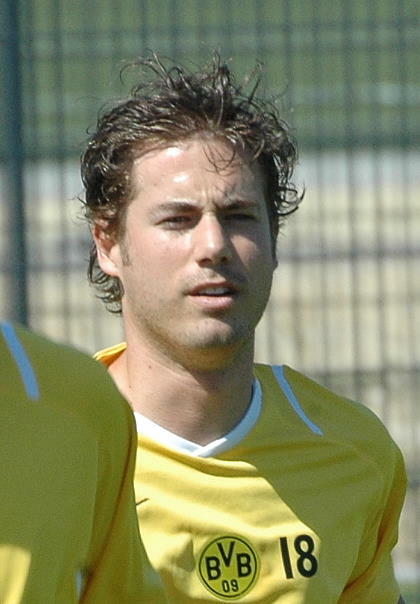 While Ricken will always be remembered for that goal, he collected 16 Germany caps, and was an unused member of the squad which reached the World Cup final in 2002. A league win and a UEFA Cup runners-up medal also arrived in 2002, to go with his earlier league title wins and of course that Champions League win in `97. In short, I’m pleased with my choice to join Benny Andrew in his Hall of Fame. Ricken was a fine player, a stereotypical one-club man who was with Borussia Dortmund in both good times and bad. It’s also a rather lovely coincidence that he scored his best goal, for a team in black and yellow (near enough), in a match his side won 3-1. The football gods have spoken – Lars, welcome to the BAHOF. I tend to do this most years on the blog and tend to get the odd thing here and there correct. So here goes for the upcoming halfway through the decade year. Starting as ever in football, I fancy Man City to make Paddy Power look a bit silly and retain the Premier League title. Teams to go down from the Barclays Premier League will be QPR, Crystal Palace and Leicester. I fancy Spurs to win the League Cup (just to be different) and Manchester United to win the FA Cup, assuming they can improve on their fairly boring first half against Yeovil. Celtic are obviously going to win the SPFL again – I fancy Hearts and Hibs to come up from the Championship with Rangers staying put for another year while Mike Ashley gets his shareholding ducks in a row. East Fife will finish in the lower half of League 2 with nothing much to look forward to for next season either. I imagine Real Madrid and Bayern Munich will win their respective league titles – I fancy Bayern to exact some revenge in the Champions League. I really hope, and think, that Marcelo Bielsa’s Marseille can hang on and win Ligue 1 in France. I can see an Algeria win in the Africa Cup of Nations, with Cape Verde doing well again (with any luck), while I think Chile can do the business on home soil in the Copa America. Turning away from football, I’m going to read a lot into Andy Murray’s early season form and decide that he will win a Grand Slam tournament this year, despite his likely low seeding in at least the Australian and the French. Nadal and Djokovic are likely to share the others though I again think Stan Wawrinka will challenge – I said this last year and I was right so I’ll say it again. Ireland will win the Six Nations again while Scotland’s excellent form in the Autumn Internationals won’t, for once, be a false dawn as they put together a decent showing in against Europe’s best. I also fancy the Irish to put in a decisive showing at the Rugby World Cup but I think South Africa will win the tournament. England will lose a low-quality Ashes series by 2-1, with an equally poor showing at the Cricket World Cup, which Australia will win. That’s all I can think of for now – feel free to agree/disagree/comment.